I was in Delhi at the time for my niece’s wedding. Visibility was virtually nil – 100 metres at best – and, devastatingly, winds were calm. Schools were closed for three days. Experts said that crop burning in neighbouring Haryana and Punjab states, car emissions, construction and the use of fireworks during the traditional Hindu festival of Diwali had caused the pollution, which, in my observation, ranks as one of India’s worst ever. As a former Delhi resident and forestry researcher, I felt a personal obligation to better understand this crisis – ideally so India can avoid a repeat this coming November. 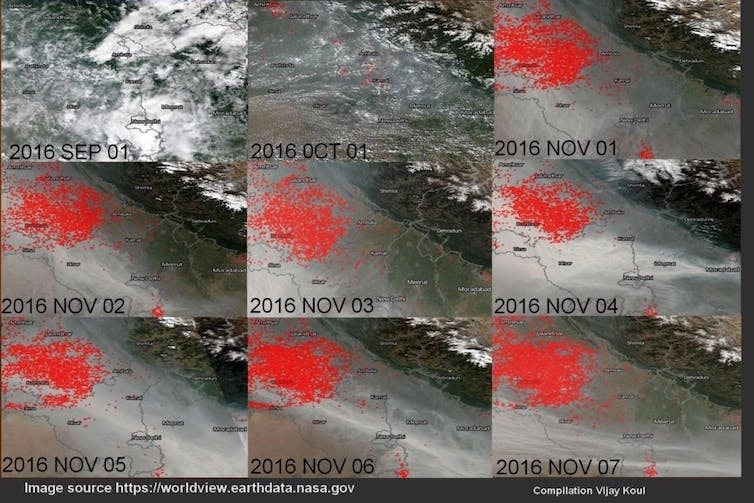 I started gathering all available data about pollution levels in Delhi, obtaining hourly and daily air-quality levels from India’s Central Pollution Control Board and, from NASA, snapshots of crop-burning for November 2016. I dug into the details, using pollution images to validate the collected data. The analysis took me six months. Here’s what I found. I found that during Delhi’s 2016 pre-monsoon and monsoon season, which is February through September, air pollution based on fine particulate matter (PM 2.5, the most hazardous contaminate) dropped as wind speed increased. This agricultural event coincides with Diwali, India’s festival of lights, which features three or four nights of fireworks before and after the festival, in October or early November. 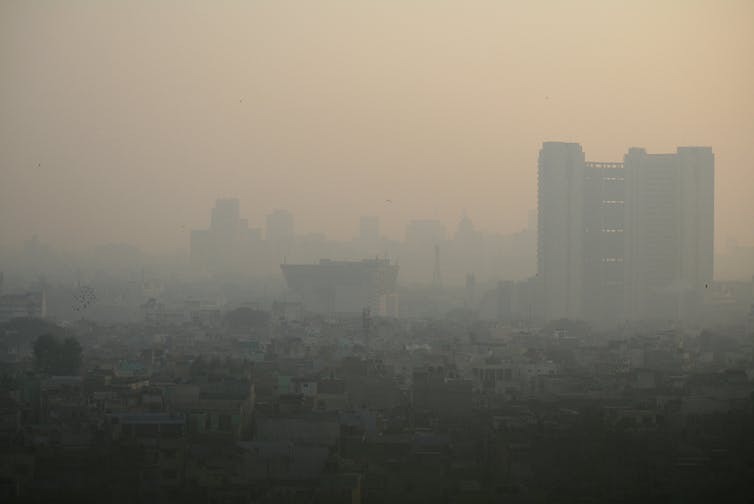 The data confirms that the days of highest pollution levels in Delhi (November 1 to November 7) coincided with large-scale residue crop-burning to the city’s northwest and, to a lesser degree, south. 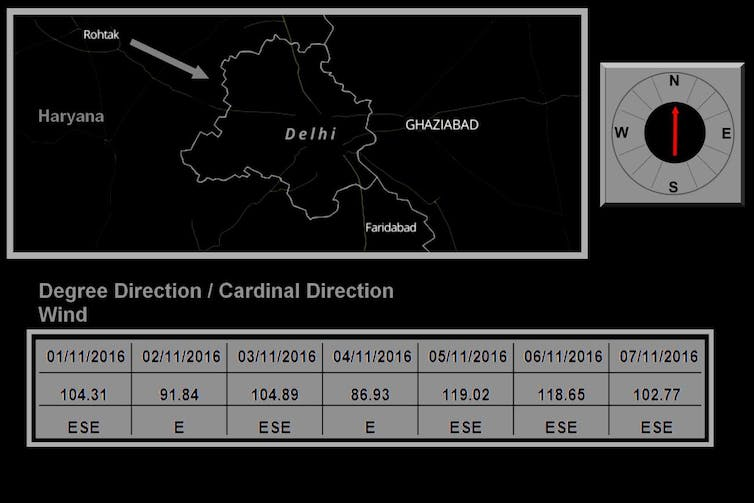 Wind-direction data from the Central Pollution Control Board in Rothak, Haryana, between November 1 and November 7 show that, on those days, the wind blew primarily east and east-southeast – that is, towards Delhi. 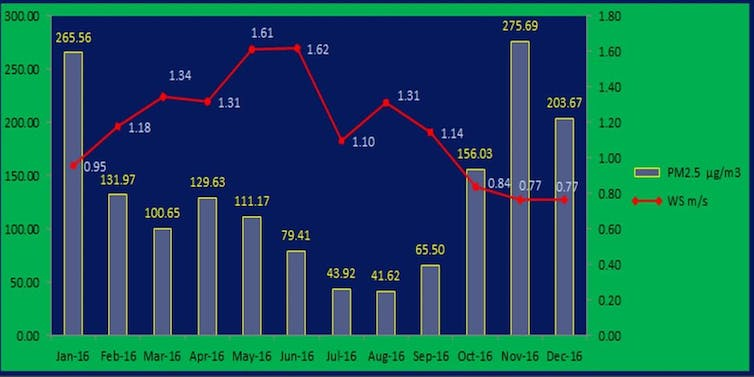 My research confirms, in great detail, that the main elements of Delhi’s record-breaking pollution levels in November 2016 were lower wind speeds, the use of fireworks during Diwali, residue crop-burning and wind direction. The government has come up with a seeder that can be used to plant wheat without the need to dispose of the straw left after the rice harvest. But even with financial help farmers can’t afford this expensive new technology. Pending regulation, raising the general public’s awareness of the issue could help. By printing pamphlets about pollution and its effects on air quality and health, as well by informing people of the daily trends of pollution through TV, radio and social media, India’s government could help teach farmers in hard-to-reach rural India about the impact of their actions. Delhi – and India in general – can no longer afford to do nothing. Brilliantly researched article. I too was in Delhi at the time and could not comprehend how the air quality had degraded so severely. More important than ever, that we are made aware of atmospheric pollution which contributes in no small way to ill health in humans and probably other species in range. Are there any estimates on the contributions of particulate matter being emitted by dung and wood or charcoal home cooking? Thanks Kanishka you liked it.